Kyanite is an attractive mineral that has a near sapphire-like blue color in some, particularly nice specimens. It is naturally a blue aluminosilicate mineral, usually found in aluminum-rich metamorphic pegmatites and/or sedimentary rock. It is an aluminum silicate mineral, often occurring as long, striated bladed crystals that may be transparent or translucent with a pearly sheen. It most often forms from the high-pressure alteration of clay minerals during the metamorphism of sedimentary rocks. Its name comes from the same origin as that of the color cyan, being derived from the Ancient Greek word κύανος. This is generally rendered into English as kyanos or kuanos and means “dark blue”. Color: Blue, white, rarely green, gray, yellow, pink, orange, and black, can be zoned. Kyanite is strongly anisotropic, in that its hardness varies depending on its crystallographic direction. 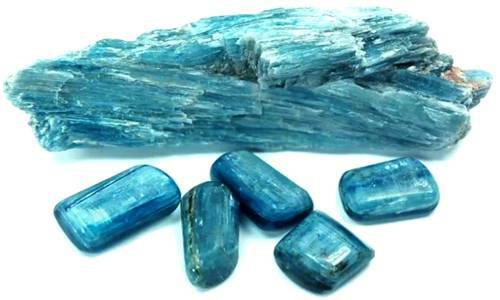 The hardness of kyanite is approximately 4.5 when scratched parallel to the long axis of the crystal and approximately 6.5 when scratched perpendicular to or across the long axis. 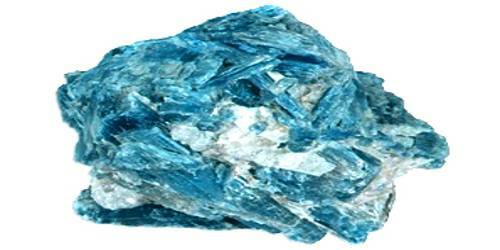 Kyanite is used primarily in refractory and ceramic products, including porcelain plumbing and dishware. It is also used in electronics, electrical insulators, and abrasives. It is one of the index minerals that are used to estimate the temperature, depth, and pressure at which a rock undergoes metamorphism. Kyanite occurs in gneiss, schist, pegmatite, and quartz veins resulting from high-pressure regional metamorphism of principally pelitic rocks. It occurs in Manhattan schist, formed under extreme pressure as a result of the two landmasses that formed supercontinent Pangaea. It occurs as detrital grains in sedimentary rocks. It occurs associated with staurolite, andalusite, sillimanite, talc, hornblende, gedrite, mullite, and corundum.